I like achievements, whether they’re called trophies, badges, or awards. Popularized by XBox Live, achievements are little goals separate from the main gameplay that mark particularly impressive or unusual accomplishments of the player. They’re often tied into a larger system, providing points or publicly viewable markers to show off the player’s prowess. “Achievement Unlocked” is nothing but achievements. There are no goals in this game except to get all 100 achievements. And they’re great. You know what you’re in for with this game before it even starts: when the splash screen appears, you’re notified that you’ve achieved the “Bandwidth Exploiter” award just for loading the game. 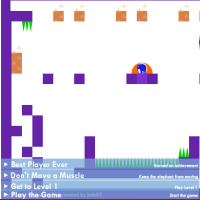 Over the course of the game, the player jumps a little elephant around the one small screen, winning such achievements as “It’s a Jump to the Left” for moving left and “You Are El” for visiting the sponsor’s homepage. You beat me to posting about this game. I have to say, this game was a real joy. Personally, I think there could be a small but full-scale version of this game. Of course, I don’t care about the achievements so much as finding the creative little jokes in them; achievements that are the result of clever searching are my favorite. This isn’t a game that can be turned into a full-scale monstrosity, but it could be perfect for an episodic flash game. Or, as a real extension, it could be a background addon to any number of other games, providing wit and spice and perhaps even MST3K style commentary while you play. Portal has some cheeky achievements, isn’t there one for choosing not to wait for the party representative? They’re not referenced in game though. This game is great, very funny. I like how you earn about 5 achievements at once as soon as the game starts.